This article is dedicated to all the couples who have gone through the refit of a boat or, for that matter, the refit of anything -and managed to come out the other end in one piece. It seems to me that most stories I have read about boat projects are written by the man in the equation, and for all intents and purposes, his other half is not an active participant in the process. My guess, though, is that for every man on a nautical mission, there’s an angst-ridden woman behind the scenes. What prompted my revelation on this subject was my husband’s suggestion that he write about his experience of refitting our boat and that I edit the piece. As you’ll see, if I had been content to merely correct the spelling, grammar, and punctuation on his submission, what follows would have read quite differently. In the spirit of the he said/she said exchange that often typifies the different points of view a husband and wife have on any given subject, I decided to describe the individual experiences we’ve had since buying our 58-foot Hatteras four years ago. That is, I decided to tell the real story. 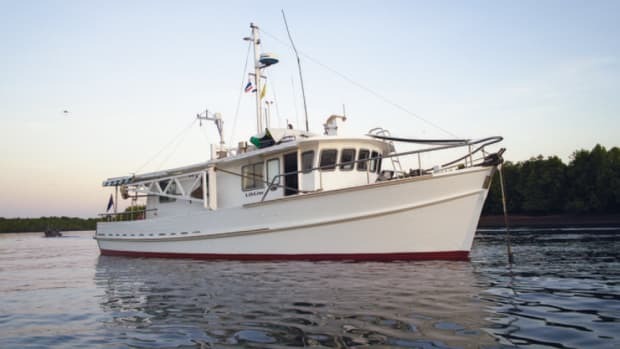 Mark: For years I worked during the winter months in Florida, refitting and crewing on some great yachts, and I always dreamed of doing a big project of my own. 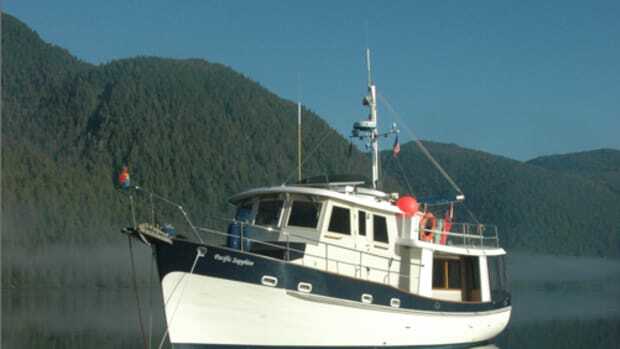 Not only did I want the challenge of doing a total yacht refit, but I also wanted something big enough for my family to enjoy cruising the waters of our amazing coast of British Columbia. Suzie: Trepidation was in my heart when Mark, upon our return from a holiday in the Bahamas, suggested that he delay his flight home to Vancouver and stay over in Ft. Lauderdale for a few days just to look around. I knew something was up, because Mark happens to be both a hopeless romantic and a consummate dreamer with a passion for anything that floats. Furthermore, he’s never been any good at covering up his extramarital love affairs with boats. Mark: The Hatteras model has always appealed to me, especially the 58 triple cabin, with its large saloon, spacious aft deck, and flybridge. So I was excited to find a 1972 triple cabin in Stuart, Florida, whose price kept dropping all of 2004 with each hurricane that blew through. She was very tired, except for her newly rebuilt 1271s and new genset. Suzie: Despite my reservations (and I’m not talking airline reservations), I flew home ahead of Mark. I knew we were in trouble when I got the call that he happened to have come across an old, banged-up Hatteras motoryacht with a scarred hull, torn canvas, and frayed lines that apparently was calling out his name. I should have known right away that it was to become ours when Mark sent home a photo: the boat in the background, and him in front wearing a goofy smile, his arms up, his fingers crossed. Mark: In August 2005 our offer was accepted, and I was busy getting paint quotes and pricing out new equipment. Hinckley Yacht Services gave me a good paint quote. They were also capable of doing some of the other repairs needed, and they provided a safe, covered space. So, into the yard she went in the second week of September. Suzie: Somehow, Mark convinced me that we couldn’t live without this particular boat and that this was to be a nice, relatively painless project. Apparently, Hinckley was the only yard that could do the kind of paint job the old girl deserved and oh, how fortuitous there was a nice little apartment Mark could rent just down the road for a couple of weeks to oversee the endeavour. Mark: I managed to get some accommodations near the yard, and we started tearing the old girl apart. Working around the yard and getting to know all the workers by name was great, and they all seemed to enjoy the effort that was going into her. As we progressed, I was busy trying to keep track of the budget what the different tasks and new equipment were costing with the yard and my other suppliers. The yard was very strict about not bringing in outside contractors, so there was some negotiating necessary. I was able to bring in some new equipment from outside suppliers, including a new mast, appliances, EZ2CY for the aft deck, window glass, and a windlass. Suzie: A couple of weeks turned into a couple of months, with endless phone calls home to send another bank draft to Hinckley. Mark dutifully sent me all the invoices, and I couldn’t help but shudder as I watched them pile up. Mark: Meanwhile, the painting went on and on, and new thrusters, rubrails, teak toerails, pulpit, and portholes were installed. 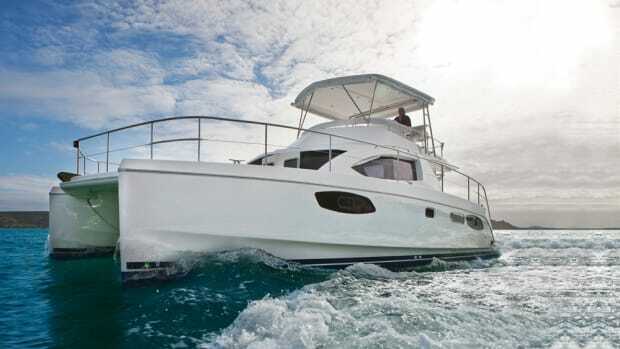 All new Raymarine electronics and satellite TV/phone were supplied and installed by an independent contractor. Being an older boat, all the small DC motors and electrical systems were 32 volt, so all that was replaced with 24-volt equipment, and new panels were installed. While this work was going on, I was busy gutting the interior. 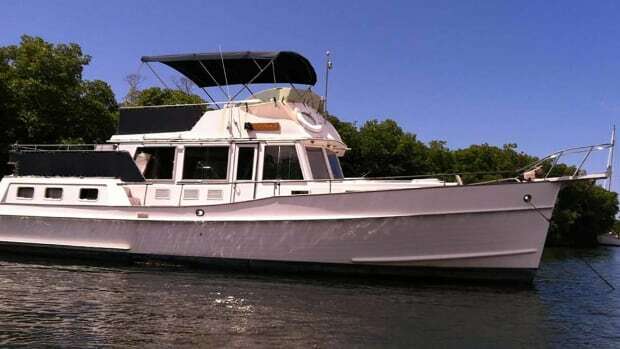 Out went the old galley, furniture, carpets, window treatments, bedding, aft deck bar, seating you name it. We also tore out the ladder to the upper helm station and built more user-friendly teak stairs, accessible from the lower helm. In addition, I had a TNT lift installed so the swim grid could be lowered into the water for easy access to the tender and for swimming off the back of the boat. Suzie: In an attempt to make me feel closer to the project, Mark would often send home pictures. In the earlier photos, it looked to me like the boat had an adequately decorated interior with maybe just a few too many mirrors in the saloon. With each installment of pictures, however, the destruction grew until nothing was recognizable. I decided to book a quick trip to Florida to see if anything was salvageable, knowing Mark’s tendency to throw out the baby with the bath water. By the time I arrived, there was nothing left of the interior. And, silly me I thought the appeal of the boat was that it was all fiberglass on the outside, so it would be low maintenance. Imagine my surprise when I saw that Mark had added teak toerails around the whole boat for that sparkling varnished-wood look. Mark: I was able to find a local cabinetmaker in Stuart, and we designed a new galley that would allow the cook to interact with guests in the saloon two steps up. The old dining nook became the perfect space for a washer and dryer. We installed two new drawer fridges, two drawer dishwashers, a propane cooktop, an electric oven, and a trash compactor into the new cabinetry. With all this new equipment, along with a teak-and-holly sole and open mahogany counters with fixed stools placed in the saloon above the galley, it made a great space for the chef. Suzie: After much driving around and dealing with slick appliance salesmen, Mark and I managed to agree on the purchase of new dishwashers, fridges, a stove, and a washer and dryer. Although Mark attempted to reassure me that eventually I would have a beautiful galley to cook in, a spacious laundry center, and a well-appointed saloon, all I could see was a completely gutted interior with wires hanging everywhere and nothing to suggest that the boat would ever be liveable. Mark: Although they had to repaint the hull twice, Hinckley’s paint job turned out beautifully, thanks especially to the great work done by the painter, Angel. The hull is a flag blue, and oyster-white topsides and red and gold boot stripes were added. The number of times I am asked, Is that a new boat? is a true testament to how great the paint job is. Suzie: Imagine my dismay when I heard that the hull needed to be painted a second time due to the fact that they had run out of paint for the final pass. Now the project was to be delayed for another few weeks. I have to concur with Mark, though, on this one the boat does look like it has a brand-new hull, and I love watching people’s faces when we tell them it’s a 72 hull. Mark: By April 2006, the time was nearing for our boat to be shipped via Dockwise Yacht Transport from Ft. Lauderdale to our home in Vancouver. After a tense session of negotiating the final bill, Searenity finally splashed. The motors started right away, and the beautiful Jimmy music was sweet to the ears. After making sure she was secure on the Dockwise ship, I flew home tired, stressed, and 10 lb. lighter. The following three weeks provided me with some well-needed rest and recuperation while the boat made her way to British Columbia. Suzie: When I finally got the call from Mark that he was heading home and that Searenity was being boarded on Dockwise, I was very tired, stressed, and 10 lb. heavier! 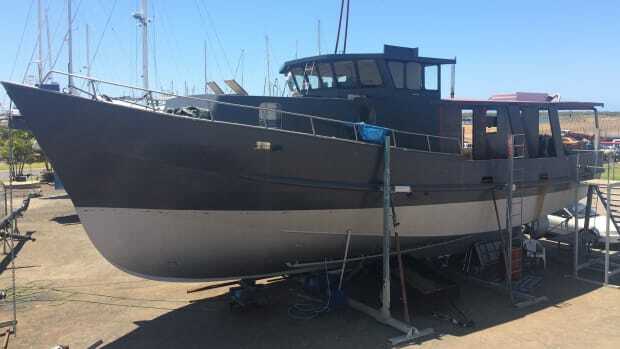 Mark: Back in Vancouver, the work has continued, with new electrical equipment, interior decor, railings, canvas, aft deck seating, bar, and a wheelhouse refit. While I tried to keep within a budget on this project, that didn’t work out so well. Like most yacht refits, it became a large hole in the water into which buckets of money went. 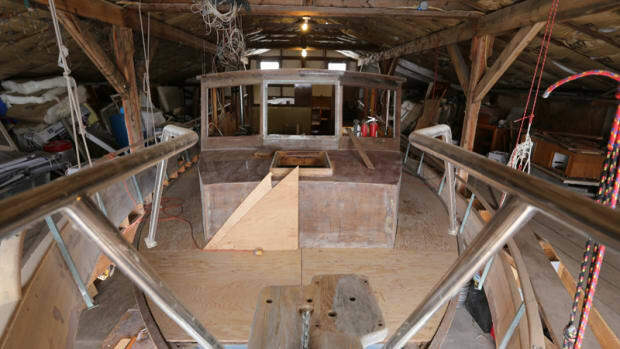 Suzie: That first July, in the height of our summer season, Searenity was up on the hard in a dusty, dirty old boatyard, still getting refitted inside and out. My job was to try and remove as much of the old vinyl wallpaper as I could with scrapers and solvents. Only occasionally did I come up for air. On one particularly hot, sunny summer day, I stood on the bridge of the boat and sprayed myself with the hose, pretending it was salt water in my face and that we were cruising the open ocean. Mark: Would we do this again? No, probably not. But we have enjoyed living aboard and doing lots of cruising with family and friends up and down the coast. All and all, the boat is my pride and joy, and worth all the effort. Suzie: Would we do this again? No, definitely not. We’ve been living on board now for a few years, and I will admit I have mellowed a little and have even been heard to say (out of my husband’s earshot) that I have mostly enjoyed living aboard as long as I don’t dwell on the fact that our nice little project turned into several years of restoration at the cost of all our savings and the proceeds from the sale of our home. Despite some of the winter-related drawbacks like losing our satellite TV connection at low tide, the challenge of walking snowy docks, and the eerie sound of the wind howling through the tarps when spring arrives, I am able to reflect on the advantages of boat living. As we float our way up the coast, the best part is that our vacations require no suitcases, no passports, and no security lines. The highlights of the refit are, in my opinion, the open galley concept; the great entertaining space on the aft deck; the TNT lift, which provides a swim platform that we call the electric beach; and the large barbecue installed on the flybridge, which makes for another great dining spot.